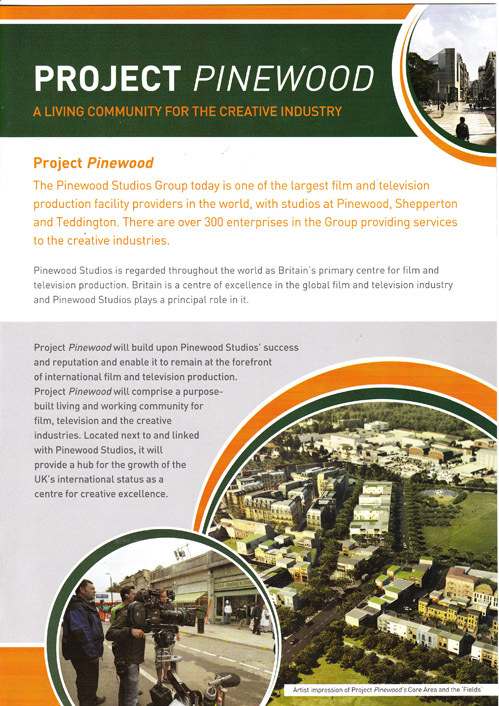 GTC members may have read about the hugely ambitious Project Pinewood, whereby the Pinewood Studios Group plan to build a large purpose-built permanent 'set' featuring whole streets in the style of European and North American locations. With carbon footprints and green issues a major consideration for shoots in the coming years, the idea is that it will not be necessary to incur all the costs of transporting a crew around the world - everything the production needs will be available right opposite the gates to the existing historic Pinewood Studios facility. But the project, which will include up to 1400 houses, of which 420 will classify as affordable housing, is creating strong opinion both for and against. On the one hand, the vision of creating 630 jobs, rising to 960 by 2022, has to be welcomed; on the other what will the environmental impact be of creating this very substantial and completely new living and working community in a beautiful part of Buckinghamshire? quoting reference 09/00706/OUT - Outline Application for development of site - Land Adjacent to Pinewood Studios (see www.projectpinewood.com/getinvolved.asp for full details on the planning application).